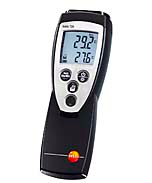 Testo 720 is the single channel measuring instrument for demanding measurements in laboratories and in industry. Air, immersion and surface probes in a measurement range from -100 to +800 degreesC can be attached to the thermometer for different measuring tasks. In combination with the indestructible TopSafe, testo 720 is resistant to corrosive media. The glass-coated probe has proved its worth in day-to-day use in the laboratory, as it too is resistant to corrosive media. An audible alarm sounds when limit values are exceeded. Current measurement data, as well as min/max data can be printed out on site on the Testo printer.